Naresh Halder, his wife and five children have just moved home. They used to live on the banks of the Yamuna river, the polluted waterway that winds its sluggish way through the centre of Delhi. But the Halders were forcibly relocated. "Near the Yamuna, my kids were safe because we knew the community there, they were going to a government school and I had work, but here I have no way of finding a job," Naresh says. The new plot of land that the family has been allocated is more than 40km, and three bus rides, from the centre of Delhi. In the last two years, more than a quarter of a million people have had their homes demolished along the banks of the Yamuna. The city authorities plan to make Delhi completely slum-free in time for the arrival of thousands of foreign athletes and spectators for the next Commonwealth Games, due to be held here in 2010. "World class city" is a phrase you often hear associated with the forthcoming tournament. 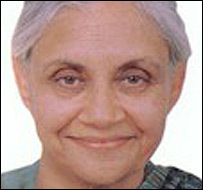 Delhi's Chief Minister, Sheila Dikshit, sees the Games as a chance to modernise. "They're a watershed, a kind of mark," she says. "The ambition is to create a world class city. Please don't think it's a magic wand, that just by saying it's going to happen it will. But that's the ambition." There's a lot to do. More than US$1bn will be spent overhauling the city's transport links, securing reliable electricity and water supplies, and regenerating the city centre, not to mention building the sports facilities. But it is the slum clearances that some people fear are at odds with one of the mission statements of the Commonwealth Games: "To develop sport for the benefit of the people." 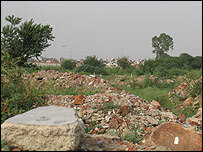 The "athletes' village" will be built on part of the east bank of the Yamuna, now cleared of slum dwellers. Those who have been relocated, albeit many miles away, are actually the lucky ones. Dr Kirin Martin, a paediatrician and founder of Asha, a charity that provides support to slum dwellers in Delhi, says many people didn't qualify for alternative housing. "Many of them actually just moved to patches of land elsewhere in the city," she says, "and again they were just kicked and shoved by the police only to go to yet another place. "I think that if the athletes ever came to know at what cost these facilities are being created, they would be very unhappy. "People have been living here for 15 or 20 years... is this the way to treat a poor man?" The authorities insist Delhi will be slum-free in time for the Games. More slums face demolition. Chief Minister Dikshit says more than 100,000 low-cost homes are being built, and ultimately the strategy will serve the long term interests of the poor. "The poorest residents have been moved because the Yamuna had to be cleaned up anyway," she says. "All of those who qualify are being given their little plots of land, with water, power and schools. It takes a little time, there are problems, but we will overcome them. "This clearance had to be done, and it has been done." Dr Kirin Martin says it falls a long way short of what is needed. If the Games are a catalyst for building a new Delhi, she believes it is one that does not include the poor. "It's only going to be a world class city for the rich," she says. "You can't ever see any of these benefits coming to the urban poor, who form one third of this city's population. "So what world class city are we talking about for these people?"